Follow up on Part I. We think of school as only a place to learn. However, a school has many other functions. Let’s look at a college website to guide us. In education, we hire a college to do many Jobs. We don’t realize how many Jobs a college does. We want college to educate, help us make friends, provide a place to stay and food to eat, sports, and maintain a name brand that sends a signal to future employers that we did something difficult. The Jobs to be Done Mental Model helps divide up these functions from a customer-facing perspective. A good school had a good library. When previous generations hired a college they expected to have a place to find information in the form of a library. The internet now does this Job. When I was in school, my college library provided access to peer-reviewed journals. Now Sci-Hub has made nearly all journals available online. The Job a library used to do has been unbundled by the internet. Funny enough, the library went from a place to find information to a place to study (at least when I was in college 10 years ago). I never took any books out of the library, but I did spend many days there writing reports. In the future where will people study? Co-working spaces like WeWork, Selina, and SeedSpace have a good chance of unbundling this Job even further. We go to college to prepare for a Career. But this is falling apart. Bryan Caplan wrote a Case Against Education which argues with evidence that college doesn’t prepare us with Career Skills. Meanwhile, coding academies consistently teach people who have never gone to college before all the skills they need to be coders. In less than 1 year, and for less than $30k, someone can learn the skills to earn a 6 figure salary. Compare this to a 4-year degree that costs more than $30k per year and graduates rarely get 6 figure salaries straight out of college. Of the 7 billion people in the world, how will we meet the person of our dreams? The odds of finding The One are against you. In the 1930s, a quarter of couples met in college but today less than 5% do. Over the last 20 years, one channel has proved that it does this Jobs very well. Need to find a life partner? Online dating does the Job. Recently I polled my Facebook friends: “Which is more valuable: An education from Princeton but no diploma; or a diploma from Princeton but no education?” Many, especially those from elite schools, thought a diploma was more valuable than the education. Wow! But more importantly, the most common clarifying question I received during the survey was “Which choice will give me the network?” The value of the network could be a major reason for forking out a quarter million dollars in some cases. There’s a saying: “Network is Networth.” People think (perhaps correctly) they can buy a network by going to an elite school. In the future how will building a Network be unbundled? You might be tempted to look at online networks. Is LinkedIn the future of Networks? Sorry, no. Unlike other unbundled Jobs of college, Network runs through everything. Our network is the people we meet at a co-working space that is your network. If you meet someone at a Coding Bootcamp that is your network. Learning websites like Coursera don’t help you build a Network; it only teaches facts. Perhaps this is why Coursera is struggling. It only does one Job — teaching facts. In the future, we will place increased value on the Brand of every Job we ask unbundled education to do. For example, when I chose a co-working space in Colombia I wanted more than just a place to work. Any company can provide a desk, chair and stable internet connection. I chose a co-working space based on the other people who work there. I chose a Network to be part of. A Job I’ll call Planned Pathway also runs through everything. Thousands of overwhelming micro decisions suddenly popup between the ages of 18 and 22 right after leaving home. But a college gives us a path saying “You don’t know what the future will hold, but if you follow this pathway you’ll get where you want to go, trust me.” And that’s an important job. When I randomly search for information online I ask myself “Am I succeeding? Will this be useful?” I don’t have a Planned Pathway that assures me all my google searches will lead somewhere. For computer science, a Planned Pathway is quickly appearing: Coding academies. A friend who went to a coding bootcamp got his first job at Airbnb. Voilá. Outside of Computer Science, colleges are still are responsible for the Planned Pathway Job. We will see if coding bootcamps can expand into design, product management and sales. Not only do colleges give you a path, they also lay out all the options: which classes to take, where the gym is, etc. A college creates a map of a universe. This directory causes the college campus bubble effect. Life doesn’t have a directory, but colleges do which serves to protect or coddle young adults, depending on our point of view. Maybe the Directory Job is already here in the form of Google Search. But maybe the Directory Job will be a more specialized site like Yelp or CourseReport.com. In 2018, 22,000 students will graduate from coding bootcamps, compared to about 93,000 graduates from traditional, accredited computer science colleges. Bootcamp graduates have increased 9x in the last 7 years and the growth rate shows no signs of slowing down. Moderate babysitting: campus police👮 →❓, state surveillance? Any many more I’m sure. Please add more Jobs that schools do in the comments. Seth Godin made a list all the way back in 2009! If you want to start a company consider any of these unbundled Jobs as a place to start. Not every Job done by Craigslist was unbundled into a separate company. Similarly, not every Job done by colleges will be unbundled into a separate company. Coursera tried to unbundle too much. They stripped college down to just the classes. However, many of us want some community in the classes we take. Coursera doesn’t have an alumni network or fun parties to go to after a class. 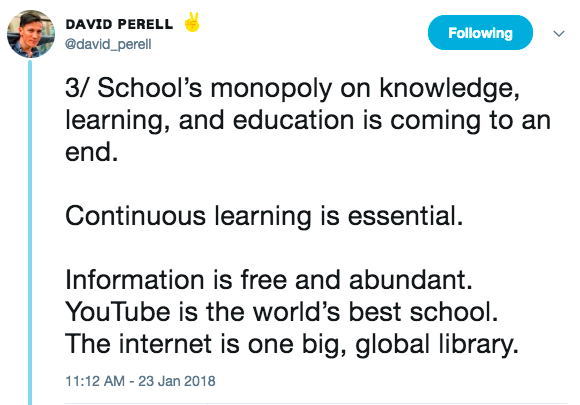 What is the optimal amount of unbundling for education?